“Easy enough to talk of soul and spirit and existential worth, but not when you’re three feet tall.” Spoiler alert! On a boating trip with his wife Louise (Randy Stuart) somewhere off the California coast, Scott Carey (Grant Williams) becomes enveloped by a mysterious radioactive mist that (mixed with some insecticide he had been exposed to earlier) causes him to start shrinking. Soon Carey becomes a media sensation and he eventually seeks solace from Clarice, a diminutive sideshow carnival performer (April Kent) until he realizes that he has become smaller than her. Forced to seek refuge in a dollhouse, Carey is attacked by his own housecat and gets trapped in the basement (his wife thinks the cat ate him). From there it’s a fight for survival as Carey attempts to make his way out of the basement (he even battles a spider in one of the film’s most dramatic scenes). My favorite scene is Carey’s existential soliloquy: “So close – the infinitesimal and the infinite. But suddenly, I knew they were really the two ends of the same concept. The unbelievably small and the unbelievably vast eventually meet – like the closing of a giant circle . . . That existence begins and ends is man’s conception, not nature’s. And I felt my body dwindling, melting, becoming nothing. My fears melted away. And in their place came acceptance. All this vast majesty of creation, it had to mean something. And then I meant something, too. Yes, smaller than the smallest, I meant something, too. To God, there is no zero. I still exist!” Outstanding existential science fiction film was based on a novel by Richard Matheson (I Am Legend), who also wrote the screenplay, and directed by Jack Arnold (It Came from Outer Space, Creature from the Black Lagoon). Avoid the lame comic remake, The Incredible Shrinking Woman (1981), which starred Lily Tomlin. 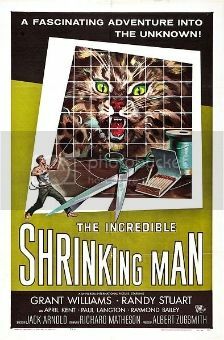 The Incredible Shrinking Man would make a great double feature with The Amazing Colossal Man (1957). Useless Trivia: Williams also starred in The Monolith Monsters (1957), The Leech Woman (1960) and Brain of Blood (1972).